Freddy's Fairytale Find--The Monkey Mat! I am so excited to share this "Find" for you! Spring is on my mind! With the warmer weather will come lots of outside fun. At the ABC kids expo this past October, I met two great gals Christie and Courtney whose booth was right across the aisle from us. Besides being two fantastic gals, they came up with a fabulous product that every household just needs to have--The Monkey Mat! 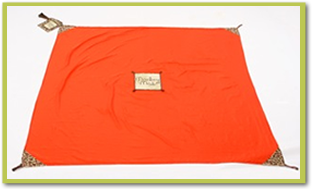 It is made out of the ultra durable parachute material and comes in lots of fun colors. It has weighted corners so it won't blow away. It has tags to hook your kids toys or your keys or anything else you want to keep put. It is nice and big so everyone can sit on it. 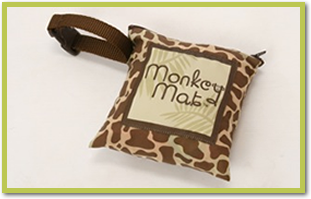 It fits in this super small pouch so just keep it in your car or stroller or purse! Makes a great gift for ANYONE!!! Go to www.monkeymat.com and get yourself one--or two!